Home decor has so many possibilities from modern to rustic, contemporary and of course classic. A classically decorated home is one of timeless style, elegance and comfort. 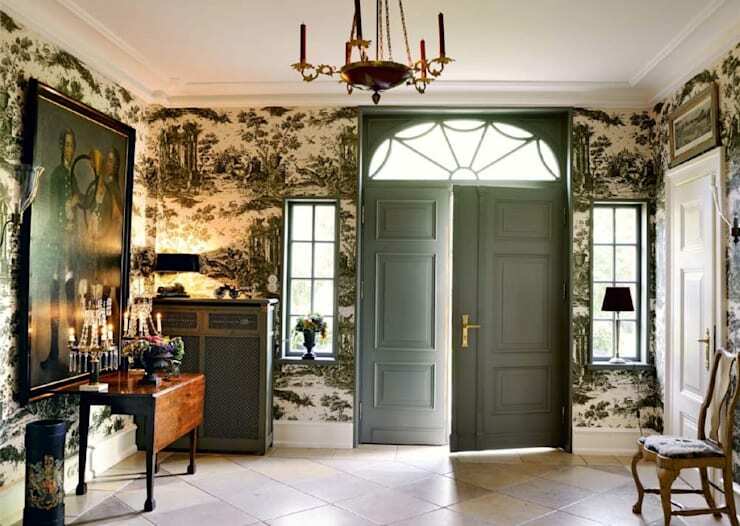 It's a decor that transcends the ages, and in some cases this style is a combination of trends, creating an even richer and more charming interior. This style may not be appreciated by all, but for those that take it seriously. This style is more than just a trend, it's a constant search for antique items of value. Elements that the trained eye can enjoy and appreciate, but that doesn't mean you cannot grow to love this stylish home decor! This Ideabook will provide you with tips to identify this stylish and excellent decor, so you can choose attractive pieces for your own home! Classic decor throughout the ages was more commonly accepted in the conservative or traditional household. Throughout the ages, the collection of decorative home items were passed down from generation to generation, maintaining their value. However, we may recognise some elements from France, which paved the way for the modern classic style. While the pre-Victorian elements of wooden panels and detailed construction are still seen throughout the world. The current classic trend is devoid of unnecessary ornaments, making it true to the aesthetic style which is a mix of conservative, vintage and even French country inspired design! The future of the classic style is eclectic and luxurious, with elegant and appealing items decorated in rich, exotic elements and textures as well as precious metals, such as gold and silver being incorporated into the design work. The use of embossed leather and silk in upholstery and curtains, decorated in bright colours creates a stunning contrast that adds a personal, yet dramatic touch. This decor, also known as Hollywood Regency and first appeared in the 1920's, during the golden age of arts and cinema. It's a trend that makes a statement regardless of the century! Traditional decor should be reminiscent of objects that were seen during that era, for example a French inspiration would see more marble and stone sculptures, detailed frames and intricate chandeliers, as well as fantastic floor lamps adding even more drama. Often a fusion of different cultural designs creates an even more fascinating decor, for example a wooden and oriental screen reminiscent of an Asian setting, incorporated within a French decor can complete the classical style! 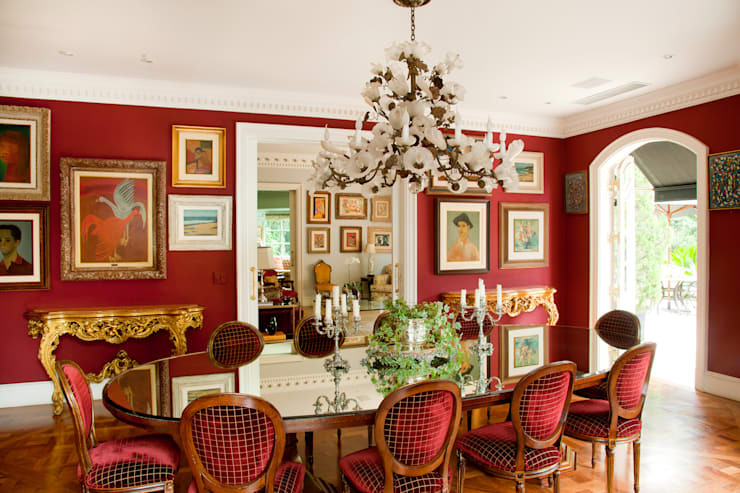 The secret to classic decor lies in symmetry and visual balance… clearly visible in this beautiful dining room. Deciding on what complimentary furniture to include in a classic style home, is winning half the decor battle! The classic style idea creates a comfortable living space, when coupled with well-chosen and timeless, yet trendy furniture. When choosing furniture for a classic home, opt for quality over design and rather spend more on a well-made piece, then replace a cheap piece of furniture every few years. When looking at furniture options consider this: brighter or darker woods are more conservative, while lighter wood is more casual. Alternatively for a vintage aspect, choose furniture that has a more worn-in look, which will show the marks of time. 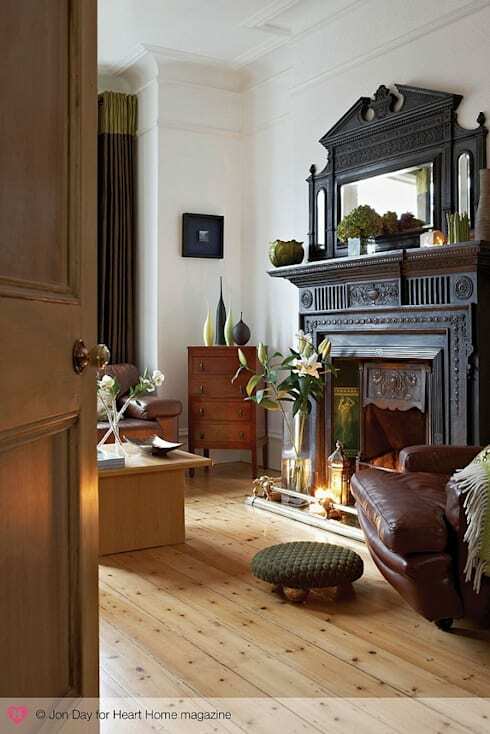 Look at warmer tones when decorating in a classic style, anything from beige, ochre, gold, red, orange and even yellow will add a cosy warmth of comfort to the space! If you are thinking about enhancing a more relaxed environment, then consider lighter and less pigmented colours. However, when painting the walls, include the same colour palette in varying shades, to create fantastic contrasts and highlights! Considering a more textured approach? Have a look at cushions or curtains with floral motifs, to create a classic environment within your home. How about restoring that old sofa to create something a bit trendier, but with a classic touch? Think about the detailed design of a picture frame or how about an intricately decorated coffee table for that authentic look? The texture and colour combination of this living room, makes classic and regal style come to life! The English design is a lot more conservative. It is dominated by well-constructed furniture, simple use of colour and delicate design that strongly contrasts with the dark wood. This classic decor is a lot more understated and introverted then its French counterpart, which is more grand, lavish and opulent in design. If rustic home design is what you are after, then The homify guide to rustic home style might just be for you! Curtains ideally create a private and intimate space within a home, shielding residents from prying eyes, while decorating the windows too. However, curtains still hold this decorative aspect, and due to technological advancement, curtains can now also protect your furniture from harmful UV rays, prolonging the lifespan of furniture, while saving you money! With so many stylish options available, curtains can match any part of the home and enhance the classic decor! This reading room is typical English classic style, but with a slight adjustment in the form of contemporary elements. The dark space contrasts perfectly with the bright room in the background, clearly defining both spaces, while maintaining harmony and perfection, wonderful work by Paula Herrero! 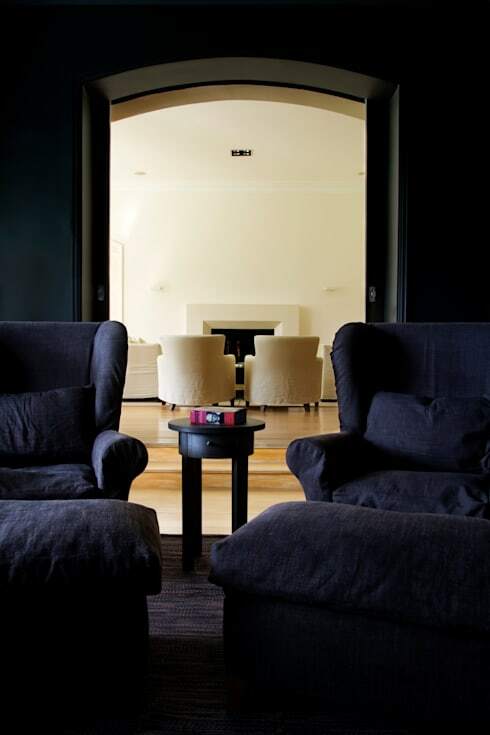 For a classic style home personified, have a look at this Ideabook: The Pink House of Delights.